With the beginning of April comes the start of spring. The weather gets warmer, homebuyers become more active, and people in the housing and mortgage industry prepare for the busiest time in the industry. 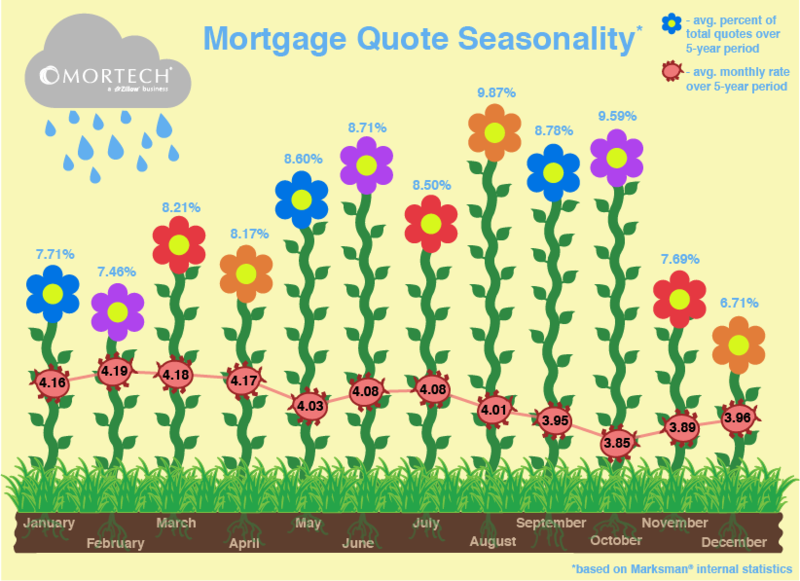 We thought it would be interesting to pull some statistics compiled internally within Marksman from the last five years and look at mortgage quote seasonality to see if there really is a big gap between the summer and the rest of the year. Looking at the numbers, there’s a lot of evidence to support the current conceptions on seasonality and real estate. December and February had the lowest number of mortgage quote volume within Marksman, and lie in a period widely considered to be the slower months in real estate throughout the year. However, September is the month with the highest percentage of total yearly mortgage quotes within Marksman over the last five years, and of the spring and summer months, April is actually the lowest. This makes sense in correlation with the average interest rate per month. Between April and October, April had the highest average interest rates over a 5 year perios by a wide margin compared to those other months, so naturally as the interest rate per month dropped, the amount of quotes rose, and by the end of summer and beginning of fall, quotes were coming in at their highest volume of the year. However, despite having some of the lowest average interest rates, November and December still had low quoting numbers, which shows the impact seasonality has on real estate. With the busiest months ahead, it’s important to have both accurate pricing, and secondary desk tools that make internal communication easier, and ensure that you’re making the most of every lead brought in. Fortunately for you, Mortech offers all of these!